Valentine, Nebraska is an easy place to love. And not just because of its name, either. When we took our trip around Nebraska this summer with my folks, we knew that one of our stops had to be Valentine. There is just so much to see and do in and around this city of only 2,803. Our first stop was Nebraska’s tallest waterfall, the 70′ high Smith Falls. Nebraska as a rule isn’t thought of as a state with beautiful waterfalls or even a place where there might be a sudden, 70′ change in elevation. Smith Falls is a beautiful exception to that thinking. We arrived at Smith Falls State Park early in the day and were surprised to discover that we were the only ones there. We’ve normally gone later in the afternoon when the falls have a number of people visiting, wading under the falls and cooling down from the heat of the day. This time, we were all alone. 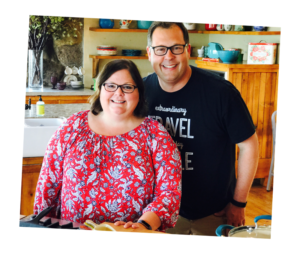 Watch the video below to see what it’s like to go to one of Nebraska’s most beautiful destinations and have the place to yourself. While most folks park in the parking lot above and use steps down to the river, those with disabilities can access the falls by driving down to the river and parking before taking the wheelchair-accessible path to the falls. All folks visiting Valentine, though, should plan a couple hours to make the trip to Smith Falls. From there, we headed back toward Valentine, pausing at the scenic overlook that overlooks the scenic Niobrara River valley. (I’m not sure Ann thinks that ‘scenic’ sentence is as clever as I do.) If you like seeing beautiful views when you travel — and who doesn’t — then you’ll definitely want to stop here. 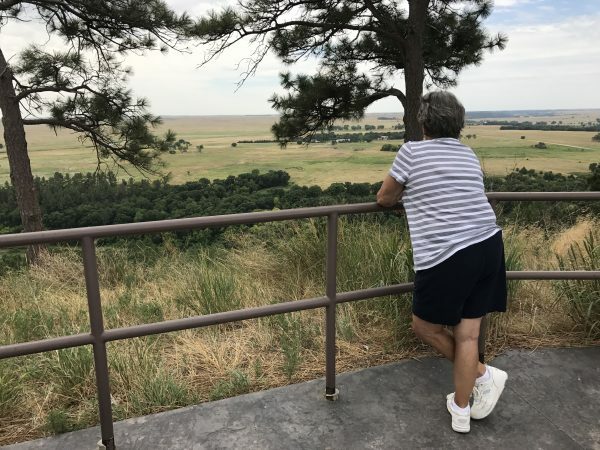 Steve’s mom overlooks the scenic view of the Fort Niobrara National Wildlife Refuge. The land on the far side of the river in this photo makes up the Fort Niobrara Wildlife Refuge, one of our favorite stops when visiting Valentine and a place we really wanted to take my parents. We love driving slowly along the roads while watching prairie dogs pop in and out of their dens. They are so fun to watch! 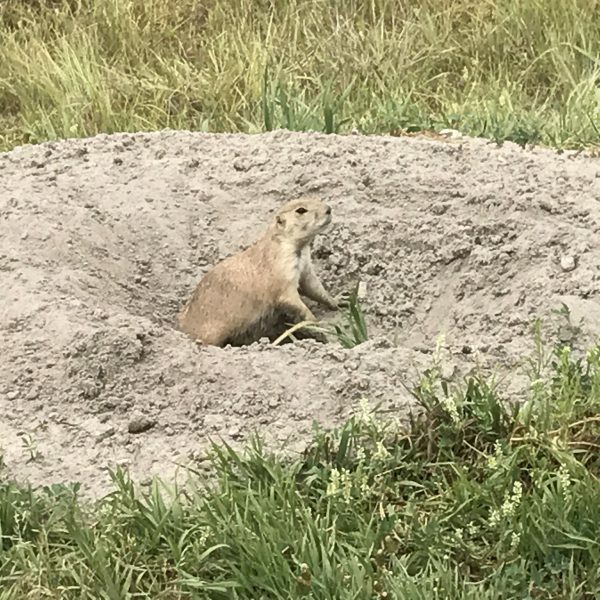 A prairie dog pops out of its den at the Fort Niobrara Wildlife Refuge. 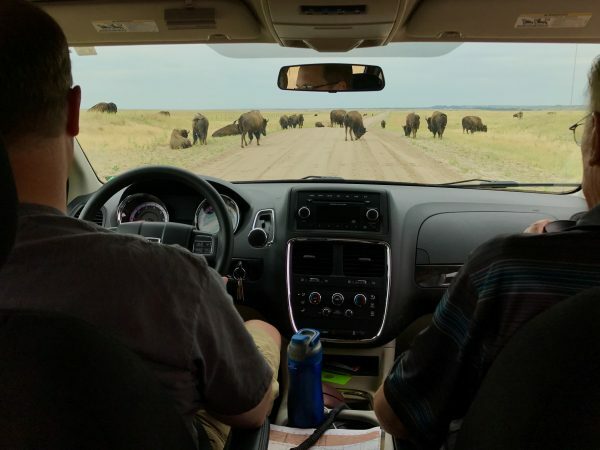 We also love driving into the field that serves as home to the reserve’s herd of bison. We love watching these majestic, 1,400 lb. animals roam the open prairie. On this particular trip, we even watched a few majestically wander onto the road between our car and the reserve’s exit. One of them even majestically lay down on the road, meaning that we had to wait a bit to leave. Think of it as a Sandhills traffic jam. We found ourselves stuck in traffic at the Fort Niobrara Wildlife Refuge. 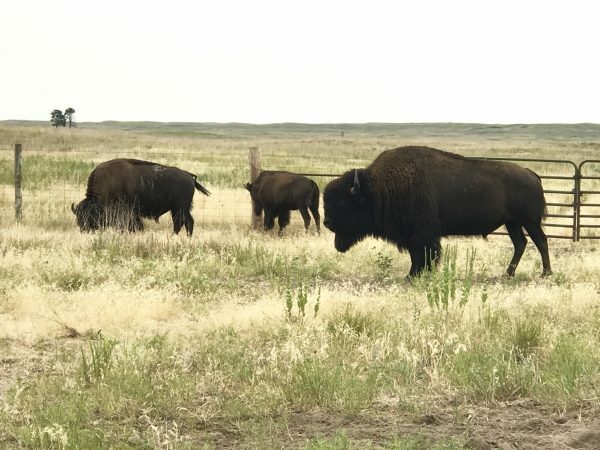 Bison grazing at the Fort Niobrara Wildlife Refuge. 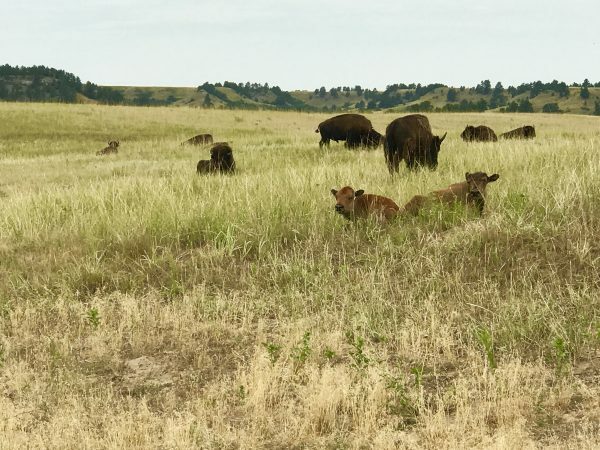 Mature bison graze as two bison calves relax in the summer sun at the Fort Niobrara National Wildlife Refuge. After the bison mosied off the road, we headed back into Valentine, our sights set on a new (to us, anyway) destination. 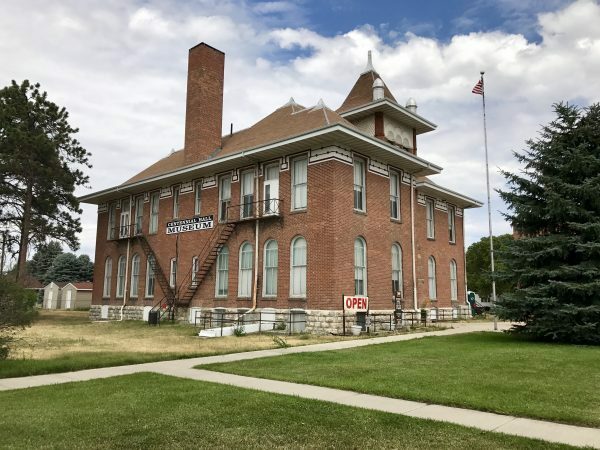 Built in 1897, Centennial Hall is Nebraska’s oldest still-standing school building. Legend says it’s haunted by the spirit of a girl who was fatally poisoned via her clarinet reed in the 1940’s. Locals are aware of that legend and even say weird things happen in the building, though we couldn’t find anyone who remembers hearing anything about an actual murder. The exterior of Centennial Hall Museum. This building is the oldest still-standing school building in Nebraska. Now a museum, it is put together unlike any museum we’ve seen. They have converted classrooms into “theme” rooms. One room has been subdivided into what different rooms in houses would have looked like in the early days of Valentine and includes some sort of hair styling machine. Another room is dedicated to fashion over the years. 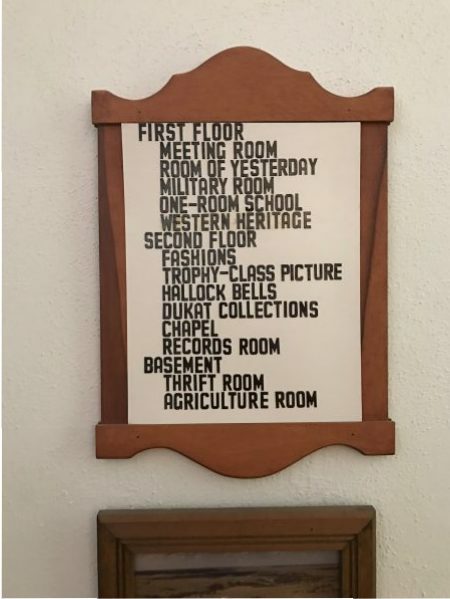 Still another features memorabilia from Valentine High School, while another room houses a collection of thousands of bells. Each of the 10+ rooms was well done and chock full of interesting artifacts. 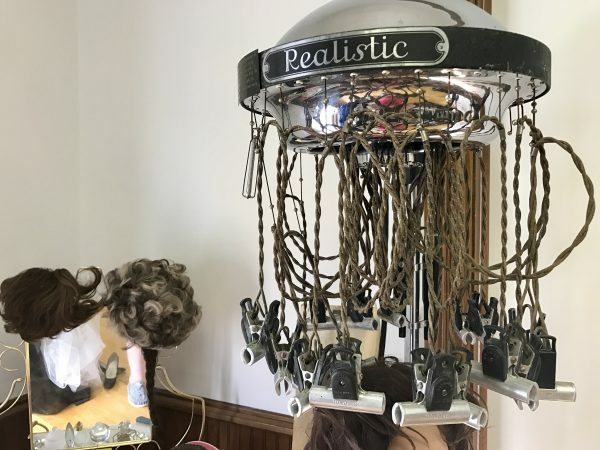 We had never seen a hair curling device quite like this one we found at Centennial Hall. A number of readers remember them, though. We were tickled when we found a stack of “Kitchen Klatter” magazines. 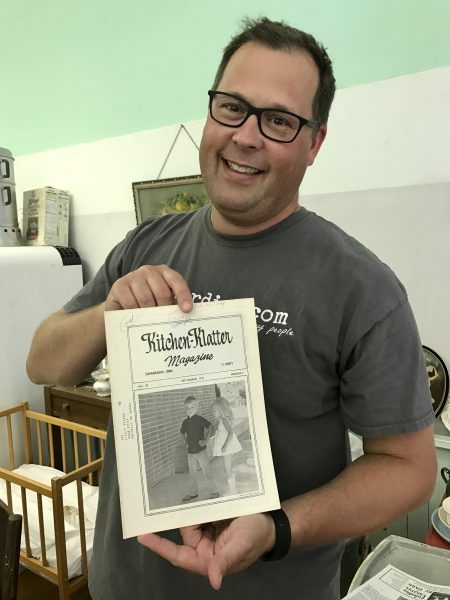 Published in my hometown of Shenandoah, Iowa, the magazines took my folks and me down memory lane — especially when we found the issue with the photo of my brother on the cover as he prepared to start kindergarten. Steve holds up the Kitchen Klatter Magazine issue that featured his brother on the cover. My mom insists that his plaid pants were very stylish back in the day. The ladies who volunteer at Centennial Hall are wonderfully nice, and we could have chatted with them all day. Of course they wouldn’t let us leave without them making a copy of the cover and pertinent pages from the magazine for us, either. From Centennial Hall we headed downtown to the Plains Trading Company. Ann and I had heard about this bookstore in a class on Nebraska travel we taught and had made a note to stop in the next time we visited Valentine. This store is definitely worth a stop. 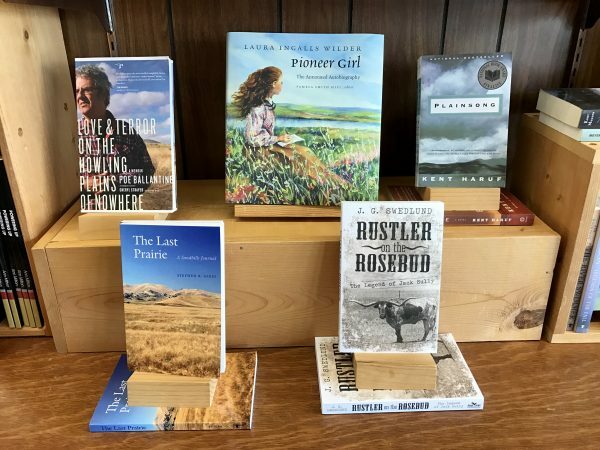 A book display featuring area books at the Plains Trading Company. 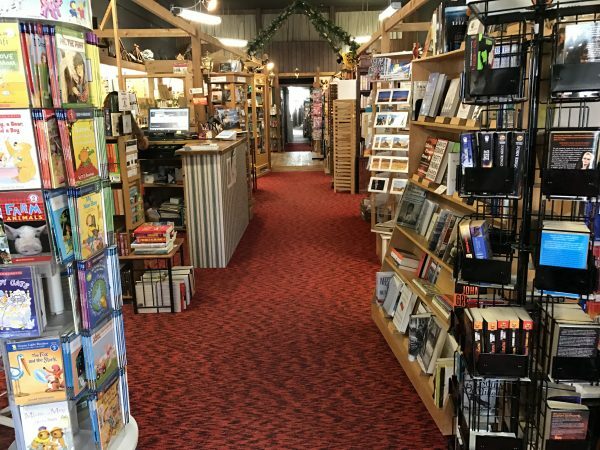 With unique books from Nebraska as well as national bestsellers, the shop has art, teacher supplies, coffee, candles, and a huge line of Burt’s Bees products. I think we spent about an hour in that store, and had a great time. The Plains Trading Company in Valentine is a great store. 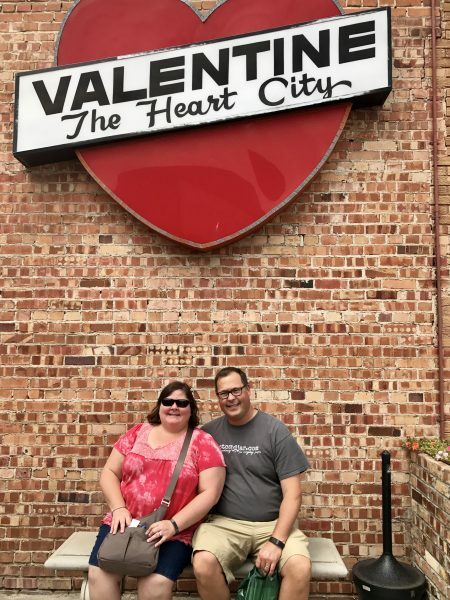 Of course, no visit to Valentine is complete without pausing for a picture under the iconic heart in downtown. After all, Valentine is the heart city. Make sure you pause to take a photo under the heart sign in Valentine. After a long day, we returned to our rooms at the Raine Motel where we freshened up and then went for dinner in the outdoor portion of their Neon restaurant. The delicious meal capped off a wonderful day visiting one of our favorite Nebraska destinations. We didn’t get to everything on our list as we would have needed another day to walk on the Cowboy Trail bridge and take the kayaking/tubing/canoeing/tanking trip down the Niobrara that we keep meaning to take. But that just means we’ll have to go back. And considering we love Valentine, that’s not a bad thing. Up next on our Nebraska adventure, we visit the mill in Neligh before heading into Norfolk.